Learning from past experiences is how we grow as individuals. So, “How?” you may ask, did I end up with yet another Triumph Spitfire? Well, let’s just say that this time around, I wasn’t looking to explore the values of classic British car ownership. This time I was hunting for a profit. Some of you may remember the write up from a while back where I talked about buying the quintessential British roadster. It was a tale about what it was like to own and live with one of these not-so-modern vehicles. I learned the hard way about what “classic British motoring” really meant. Don’t worry, I haven’t had a sudden change of heart. The beauty of these old roadsters lies in their mechanical simplicity. Armed with not much more than a run-of-the-mill set of tools and a smidge of mechanical aptitude, a car like the Spitfire can be made mechanically “new” again without too much financial outlay. That makes it a wonderful candidate for a revitalization project. I’m going to show you how to turn an old Spitfire into a tidy profit by performing some straightforward, beginner-level repairs. If you want to grab a great price on one of these unique cars, you can’t simply wait around for the buy of a lifetime. That perfect alignment of space and time rarely occurs. Instead, you must be on the lookout for one with the “doesn’t run” factor present. This means a car that is cosmetically nice, but, obviously, doesn’t run under its own power. When this factor is present, a prized machine is now not much more than a large fancy paperweight. The seller of such a vehicle usually just wants it out of their garage. As a mechanically-savvy buyer, this is a prime situation. I was on my lunch break, doing my typical Craigslist cruising, when a particular listing caught my eye. 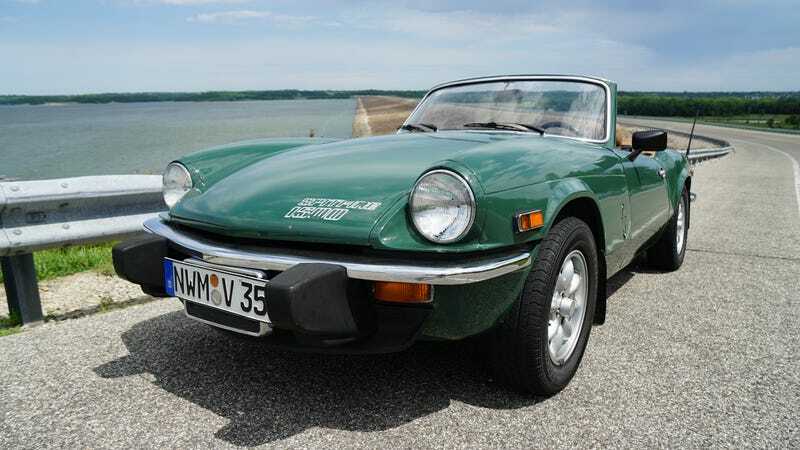 Priced at a reasonable $3,300 was a 1977 Triumph Spitfire in British Racing Green. Has there ever been a better color for a car like this to wear? In my opinion, no. I clicked the ad. All the right words were present. These were the same words that undoubtedly had turned most potential buyers away. The words may have been the very reason the listing had already lasted a week. For me, the words only drew me in closer. Sometimes, the fewer the words, the more enticing it all becomes. I called the seller and later that night I was on my way to check the car out. The car was huddled away in a cramped two car garage. It was stablemates with a large ’60s land-yacht-Lincoln. It looked like the Triumph hadn’t moved in over a year. After talking it over with the seller, he said the car used to run great. After parking it for a while, he said it wouldn’t start back up. I saw that the Spitfire had been fitted with an aftermarket electronic fuel pump, which when switched on, was loud and didn’t seem to be doing much of anything. I had a strong feeling that this aftermarket part was the no-start culprit. Walking around the car, I could tell the paint was original and it was indeed free of rust. The odometer only showed 50,000 miles. I checked the crankshaft for excessive end float, which is a must-do if you’re interested in buying one of these machines. I had the seller push depress the clutch pedal while I observed the harmonic balancer at the front of the engine. There was no perceivable movement at all, which pointed to a solid engine. wheels. It all came together to form a handsome-looking roadster that appeared to be a great buy. I knew I wanted it, but I also knew I wouldn’t be driving it home. This Triumph wasn’t a ten-minute-fix away from being road ready. With that bargaining chip at the ready, I made the seller an offer. After the seller stewed the prospect over for a while, we were able to shake hands. I came away from the deal with a genuine-looking $2,800 Spitfire. Removing the car from its extended slumber. Of course, the car didn’t run. So I immediately had to call up a towing company and get the car hauled away for another $65. Not too shabby. Dropping the little Triumph into its new home. With the car plopped down in the garage, it was time to start diagnosing the no-start issue and see how deep the rabbit hole went. Goal number one with this car was to get it started. The engine would turn over, all of the lights worked, and that electric fuel pump would just hum away. The only thing missing was the internal combustion of this little gasoline engine. Even though there was plenty of gas in the tank, it seemed like the engine wasn’t getting any fuel. I removed the fuel line that went directly into the carburetor and dropped it into a jar. The idea here was to check for fuel flow when the fuel pump was turned on. This would give me a good idea of the fuel pump’s health. With the key switched to the “ON” position, and the electric fuel pump clacking away, I shot a glance at the jar that should have been filling with gasoline. There wasn’t a drop to be seen. With that simple test complete, I let out sigh of relief. Here was the problem, and it was going to be a cheap and easy fix. With a new mechanical fuel pump, ten feet of new rubber fuel hose, and a new fuel filter in hand, I went to work. The new fuel pump was quick to install with only two nuts securing it to the side of the engine block. Using the old fuel hose as a template, I cut the new rubber hose to length. After routing the new fuel hose throughout the engine bay, it was time to try out this new fuel pump. I turned the key to “ON” and let the engine crank for a few seconds. After what seemed like an eternity, the fuel system was fully primed and the engine sprung to life. I’m not pulling your leg here, it literally started right up. The old fuel pump was the root cause of the no-start issue. The cooling system on this car was in a sorry state to say the least. The coolant itself had the rusty-brownish-green color which is the hallmark of neglect. The water pump also had a small leak and the upper radiator hose was cracked. I wouldn’t put much trust in this system keeping things cool. I started in by removing all of the old coolant from the radiator and the engine block. Unlike modern cooling systems, this car wasn’t fitted with coolant drain plug on the radiator. The only way to get the old liquid out of the system is to carefully remove the bottom radiator hose in a futile attempt to reduce the impending coolant geyser from opening up. This sort of job is almost always messy, and as to be expected, the garage floor was soon covered in old coolant. No matter how hard you try to contain it, it still results in a mess; that’s just how coolant draining tends to go. With the system drained and all of the coolant hoses removed, I could remove the radiator from the car. After close inspection, the all-metal radiator appeared to be in good shape. It needed a coat of paint and there was no better time than now to give it a quick lick of gloss black. Next up was to replace the old and leaky water pump. Held on with only three nuts and sealed with a paper gasket, removing the old pump was a breeze. With the new pump mounted up, the small coolant leak would be a thing of the past. The final part to be exchanged on the system was the upper radiator hose. This looked to be the original hose, and it was thoroughly cracked. With the new hose in place, the coolant system took on a much more trustworthy appearance. All that remained was to fill the system up with new coolant. Job done! While the engine ran decently with the new fuel pump, the performance could certainly be improved upon. It was time to give the little engine a thorough going-over to ensure it would run to the best of its ability. The first item on my engine maintenance list was to check the valve clearances. While this isn’t an overly difficult job, it does require a set of feeler gauges and an understanding of how the valvetrain works in an engine. The first step is to remove the rocker cover so you have access the valvetrain. The cover was looking terrible but I would address that later. This engine utilizes screw-and-lock-nut style adjusters on the rocker arms, which makes the job of adjusting the valve clearances as easy as they come. I won’t go into detail on how to adjust the valves as that procedure is covered in depth elsewhere in the internet. An important note is that this job should only be performed when the engine is completely cold. The basic principle of the valve adjustment on a pushrod-style engine like this is to take the measurement between the rocker arm and valve stem on each valve when the valve is in the closed (relaxed) position. You will slide the feeler gauge into the gap between the rocker arm and valve stem to determine whether the gap is too large or too small. From there you can adjust the clearance to the correct specification by turning the screw on the rocker arm and then securing the new setting with the lock nut. With the valve clearances all set to specification, it was time to give the rocker cover a bit of sprucing up. I removed as much of the old paint as I could and then shot a coat of aluminum colored paint on it. I then applied a new cork gasket around the perimeter of the rocker cover. I used a gasket dressing called “High Tack” to secure the cork gasket in place while refitting the cover to the engine. Every component of the ignition system, from the spark plugs to the distributor cap, had an aged look. I purchased an ignition tune up kit made by Lucas, the OEM electrical parts supplier for Triumph. Included in the kit was a new distributor rotor and cap, spark plug wires, and spark plugs. All of these items can be installed in a matter of minutes. With the new ignition parts in, I figured it would be a good idea to set the ignition timing on the engine. To do this, you will need to have a timing light at the ready. With the distributor loosened in its mount, the engine running, and the timing light pointed directly at the harmonic balancer, I could then read the ignition timing off of the timing marks on the front of the engine. The timing was set pretty far advanced which was making the engine idle rough. By rotating the distributor slightly, I was able to retard the timing enough so that engine settled into a comfortable, smooth idle. The air filter that was on the car was chocked full of dead bugs and dirt. The oil was black as night. Maintenance items like this are sight for sore eyes because of their sheer simplicity. A new air filter can quickly be installed by removing two bolts from the air cleaner housing. Draining the old oil and refilling the engine with new is as stress-free as it gets. The golden-clear sheen on the oil dipstick gives you that sense of satisfaction that the engine is now protected for a few thousand more miles. A better looking engine bay than where it started. With the front of the car in the air, I rooted around the steering linkages in a search for anything that looked overly worn. You must remember that with a car this old, nothing looks in great condition, so finding potential culprits can’t be done based solely on appearance alone. Sometimes it takes some poking, prodding, and yanking to find out what is loose. Ultimately, I found that a wheel bearing was bad, and the tie rod ends were completely toast. Great! The most difficult job of the two was replacing the bad wheel bearing. You must be able to drive out the old bearing races from the hub, then drive in the new bearing races. Since I didn’t have a shop press, I found that punches, large sockets and a hammer did the trick. Just be careful to not score the bearing race surface when using such precise tools as these. The tie rod ends are fairly straightforward to replace. Since you won’t be reusing the tie rod ends once they are removed, I find that a pickle fork is the tool of choice to quickly separate the old tie rod end taper from the steering knuckle. Count the number of complete rotations that are made when unscrewing the old tie rod end from the tie rod itself. This will give you an estimation of proper alignment when you go to refit the new tie rods. A professional alignment will still be necessary after performing this repair to ensure the front wheels are pointing straight ahead. With the new tie rod ends and wheel bearing installed, the steering now had a far more direct feel to it. There was a lot of clunking coming from the front end of the car. This was mainly due to the original rubber bushings in the upper and lower control arms, which had become non-existent. I decided to fit new polyurethane control arm bushings to not only get rid of the horrible noises, but to also sharpen up the handling beyond what you could expect from rubber replacements. While I was in there, I noticed that the bushings in the trunnions (Triumph’s equivalent of a lower ball joint) were shot as well. I fitted new bushings here to ensure that no play could be felt throughout the front suspension. While not a repair per se, I felt this was a good time to flush out all of the old fluid in the car’s brake and clutch systems. The old fluid was dark and definitely looked ripe for replacement. With golden, bubble-free fluid now populating the hydraulic lines of the brake and clutch components, I could now feel confident that both of these systems would work reliably for many miles to come. The interior was in good shape overall, but there were a few spots that could easily be improved on. The fuel gauge was reading inaccurately and the trunk light wasn’t working. While neither of these things is a huge deal if left unattended, they might cause a potential buyer to feel uneasy about the car. The fuel gauge was reading inaccurately because the plastic float on the sending unit in the gas tank was no longer floating. Apparently it had developed a crack and had taken on fuel. I decided to fit a new sending unit instead of attempting to repair the old one because the new unit was so affordable. With that repair completed, the fuel gauge began to read correctly again. The trunk light, which should turn on when the trunk lid is opened, was not functioning. This is because the light housing was completely missing. Lucky for me the wiring for the light was still intact in the trunk so all I had to do was purchase a new light housing. I then had to clean up the switch contacts on the trunk hinge so that voltage would reach the light. The trunk was once again illuminated with a depressingly faint, mid-’70s glow. “Creature Comforts” is being generous, because that assumes that something can be done to make this car comfortable for its passengers. That feat is impossible. However, you can make things slightly more convenient, such as installing seat belt hangers. The seat belts in the Triumph Spitfire are awkward to say the least. You have to fish them out from underneath or behind the seat - wherever they disappeared to the last time they were unbuckled. However, there is an aftermarket solution to this seat belt confusion: seat belt hangers. These mount conveniently underneath the seats’ headrests. With these aftermarket seat belt hangers in place, the belts are kept in a somewhat predictable location when you go to reach for them. The trunk seal, which at one point was made of rubber, had turned to a powdery coal-like substance that no longer “sealed.” It also allowed the trunk to flap about when you hit a bump, which was less than appealing. The old seal was a bit of a pain to remove, but it was worth the effort. With the new seal fitted, the cabin quieted down a noticeable amount. The exterior of the car was actually in great original condition, but there was one trim piece that made the car look a bit tatty: the chrome windshield trim. The chrome lamination was separating and the structure of the trim was degrading to the point where it was curling and bending away from the windshield frame. It looked bad, and not “bad” in a patina type of way. It just needed to go. Removing the old trim was easy - I was able to just rip it right off. Installing the new chrome trim was a whole different animal. This alone took me two and a half hours to figure out the right method to install it. The trim has to fit in grooves inside of the windshield rubber gasket. I found that using the various styles of pick tools, along with a copious amount of soapy water, allowed me to slip the trim into the gasket grooves. The final repair on the car was to replace the gas cap seal. There was a strong scent of gasoline in the interior of the car while driving - not good. I eventually found that the gas cap seal didn’t just need to be replaced, but it was completely missing. How does that even happen? Regardless, the new seal simply slipped onto the gas cap and the gasoline fumes were no more. What a relief! The Triumph Spitfire was finally complete, and unlike other vehicles that I have spent time bringing back from the dead, I had no desire to keep this one around. It was a cool car that ran as well as one possibly could, and it looked great doing it. It was in excellent condition and ready for a new owner - someone who was still trying to figure out what it meant to own an old British motoring icon. I threw the car up on Craigslist and within two weeks, it was gone. With a sale price of $5,400, the new owner drove away with a smile on his face. Sure, I made a profit on the car, but I still felt good about being able to deliver an interesting old classic to someone who can go on to appreciate it for many miles to come. These cars are beautiful not only because of their appearance, but also because of their mechanical simplicity. With a basic set of tools and a little bit of determination, anyone can turn a non-runner destined for the scrap heap into a valuable vehicle of desire.